Next to plain white dishes, our richly colored dinnerware brings warmth and appetizing ambiance to every meal. The glazed stoneware with visible natural undertones and rubbed edges is handcrafted in Portugal with an artisan-made look and feel. Choose a single color or make it fun by layering mixed colors according to the mood and menu. DETAILS YOU’LL APPRECIATE Crafted of stoneware with a hand applied patine. Features a sprayed glaze. All pieces are hand finished. KEY PRODUCT POINTS Food, dishwasher and microwave-safe. Made in Portugal. 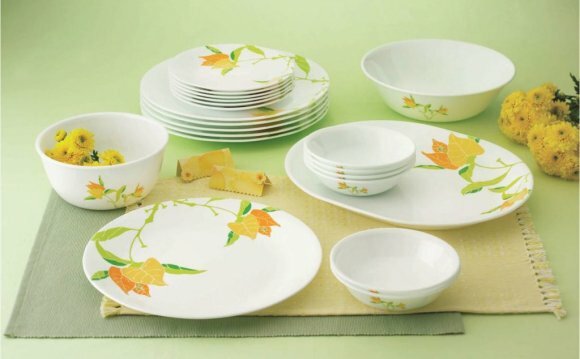 SET INFORMATION 16-piece set includes 4 dinner plates, 4 salad plates, 4 cereal or soup bowls and 4 mugs. Dimensions & Care DIMENSIONS Dinner Plate: 12" diameter Salad Plate: 9.5" diameter Cereal Bowl: 7" diameter, 2.5" high Cereal Bowl Capacity: 22 ounces Soup Bowl: 6" diameter, 4" high Soup Bowl Capacity: 24 ounces Mug: 5.5" diameter, 4" high Mug Capacity: 12 ounces CARE & MAINTENANCE Food, dishwasher and microwave-safe. While dishes are microwave-safe, they may become hot. Handle carefully. Shipping & Return Info SHIPPING UPS can deliver most in-stock items within 4-5 business days. Next Day Delivery and Processing We can arrange for next day delivery to most destinations within the contiguous 48 states, for an extra charge of $17.50 per address. If we receive your order by 6pm PT Monday through Friday, you'll receive your order the next business day; orders placed on Friday after 6pm PT through Sunday will arrive on Tuesday. Note: Next Day Delivery service is not available for some oversized items, White Glove Delivery, out of stock items, personalized items or for items shipped directly from the manufacturer. Surcharges Select oversized items have an additional delivery and processing surcharge; this charge is listed below the item price. View the complete Shipping and Delivery Information page. HASSLE-FREE RETURNS We take great pride in the quality and craftsmanship of each and every Pottery Barn product and we hope you love your purchase. If for any reason you do not, you have 30 days - or 7 days for all Quick Ship upholstery items - to return your purchase for a full refund or exchange. You can return most non-furniture items to your local Pottery Barn store - FREE. Exceptions Delivery fees are non-refundable and prior purchases are not eligible for a price adjustment. The following items are non-eligible for returns or exchanges: Monogrammed items Mattresses Gift cards Special-order items (including made-to-order upholstery and custom order rugs) Final Sale items (identified by a price ending in $.X7 or $.X9) Items damaged through normal wear and tear. Questions? See our full Returns Policy. Our Quality Commitment Our Commitment We have a firm commitment to quality. We take great pride in our timeless designs, premium materials and expert craftsmanship. The Hand of the Artist Nearly all of our products are imagined and designed in our San Francisco studios. Our artists hand-create prototypes for everything from seasonal dinnerware to patchwork quilts to lighting. Free Interior Design Services Need design help? We offer free, no-strings-attached Interior Design Services. Get advice and inspiration from our specialists in-store, over the phone or by email. Designers will even make in-home visits, where they can take measurements, discuss color options, and give tips on any room.